I picked up a black 64gb 4g lte Verizon model. The first thing you notice about the new iPad is the brilliant gorgeous jaw dropping display. It really is stunning and was worth the upgrade price alone. Text really looks sharp especially when reading magazines. There is a very detailed review over at displaymate. The second thing you will notice is the weight. I already thought the iPad 2 was pretty heavy. The new iPad is .1 lbs heavier and I swear I can feel it. Dictation was added instead of full Siri support. I guess they really want to push that iPhone 4s. I tried it out a little bit but didn't seem to work too well. Originally, I was planning to dictate this entire review. Yeah, I changed my mind pretty quickly. Instead, I'm testing out the blogsy app (it's pretty slick) and my iKeyboard. The new back facing camera actually takes a decent photo now. The 1080p video is nice too. Still, you aren't going to catch me taking that many photos or videos with the iPad. That's just silly. I love Verizon's data plans though. They match up quite nicely with my walmart virgin mobile mifi including the 1gb for 30 days for $20. LTE speeds are amazing. 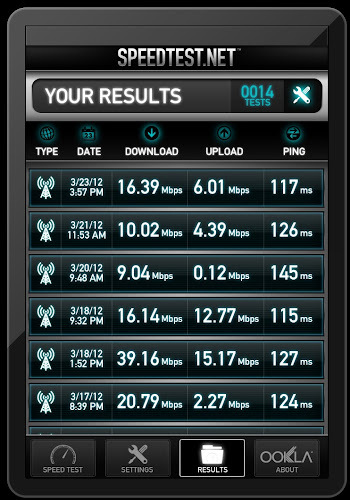 I ran the speedtest.net app all over town in different locations to get a good average. Over 14 sample I had an average of 14.6 Mbps down and 9.2 Mbps up. I had a max of 39 Mbps down and 19 Mbps up. Basically, surfing on LTE feels no diffent than my home Internet connection (max turbo uverse 25/3). Retina display also brought with it some app compatibility problems. Zinio just got an update to fix rendering speed issues. It's faster but still not quite instant. Magazines on the nook app look fine even though I'm not entirely sure it's taking full advantage of retina since there hasn't been an update yet. Some magazines from newsstand that depend on the zinio engine is also having issues like all future publications (maximum pc). Text takes forever to render. You can see it paint in blocks. Hopefully they get updated quickly now that zinio has been updated. Also, retina won't help if your content isn't high enough resolution to begin with like cbr files where the comic wasn't scanned in at a high enough dpi. Heat. It's really not that big of a deal. Yes, it's warmer than the iPad 2 but it doesn't get THAT hot. Just basic surfing and reading the new iPad just gets very slight warm to the touch. While playing a more demanding 3D game like modern combat 3 it does get warm but not hot like a laptop. As far as accessories I went with the same basic setup as the iPad 2. I'm using an icarbons brushed aluminum back only, dark grey smart cover, case logic sleeve pls9, and I'll add a crystal power support screen protector as soon as they release the new ones. Just see my iPad 2 review for details. The "quad core" GPU will be a nice boost in gaming but the cpu is basically the same which is too bad. A bit more oomph for decoding mkv's would have been nice. Memory has doubled and is now at 1GB which is nice. Nice touch that the iPad came fully charged out of the box. Highly recommended. The screen and LTE 4G (in my book LTE is the only true definition of 4g. Hsdpa+, WiMAX, etc are all posers) are reasons enough to upgrade. Sure, there weren't a lot of other massive changes but those 2 reasons alone really do make a big impact on how you use a tablet on a daily basis. would make it more powerful. Good review. Other nice plus is that iPhone only apps display much sharper now. Several negatives, but not show stoppers: bigger battery means longer charge times. Heavier AND thicker than iPad 2... This is what happens when Jobs isn't around asserting his reality distortion field on the Apple engineers. Finally I got a chance to take new iPad 3 into my arms. As for design I can say that I's pretty the same. But at the same time you certainly have a feeling that you hold something better in your hands than iPad 2 (May be because it's iPad 3, lol). What about functionality - everything works smoothly (as always, though)). So my first sensations are absolutely positive. Hope that it won't disaapoint me later on.